Wait, what day is it? Did you... oh man, you did remember to order the flowers, didn't you? What time does Lush open? How quickly can Moonpig get a card here? That's right folks, it's Mother's Day! Mothers everywhere, we salute you, and in your honour we've taken a look at our top stagey matriarchs. Have a read, pick your favourite, then get off the internet and give your own a hug. 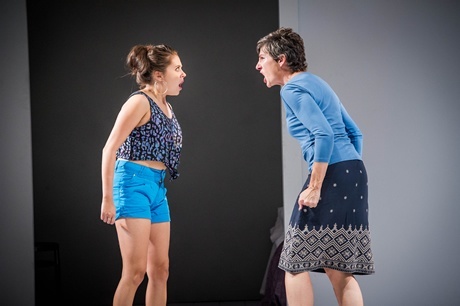 Willy Russell's Liverpudlian tale of nature versus nurture is the third longest-running musical in West End history and let's be honest, the leading lady doesn't exactly have a great time of it - audiences just love a bleak portrait of motherhood. But she's been played by all the Nolans and an actual Spice Girl so that's gotta count for something. Donna's an all-round good egg. She runs her own business, has a close relationship with her daughter, a good set of pipes, a great group of supportive friends who also double as backing singers, and she's been Streeped. What a woman. Think you've got a pushy mother? She ain't got nothing on Rose. Check out Bette Midler in Gypsy here. A novel entry on this list by virtue of being deceased for the entire production, Mama Elliot makes the cut for breaking our hearts from beyond the grave. Lesley Manville earned critical acclaim (and an Olivier nomination) for her portrayal of Helene Alving in Richard Eyre's revival of Ibsen's Ghosts. A heartbreaking tale of a woman struggling to shield her son from the sins of his late father, we'd be lying if we said it works out well for her. With sold out runs at the Royal Court and Duke of York's Theatre, April De Angelis' Jumpy starred Tamsin Greig as Hilary. A woman who once protested at Greenham Common, at 50 years old Hilary expends most of her energy fighting with her rebellious teenage daughter. A touching portrait of modern motherhood, Hilary shows us how times and battles change, but mostly makes you want to call your mam. You can't stop her happiness coz she likes the way she is. If this rundown has taught us anything it's that mothers often have a time of it on stage, but not Edna - during the course of Hairspray she overcomes agoraphobia and learns to love the skin she's in. Right on! Life lesson: if you want to be smiling at curtain call, be a man in drag.